Pennsylvanian police arrested a church member and are investigating after he allegedly shot to death a fellow member at the Keystone Fellowship Church in Montgomery County during the worship service Sunday. A church member, who has not been identified, shot 27-year-old Robert Braxton of Montgomeryville in the chest after "a disturbance that escalated into an altercation between two church members," according to Montgomery County District Attorney Kevin Steele, ABC News reported. Braxton was declared dead at Lansdale Hospital, where he he was taken after the incident. An autopsy is scheduled for Monday. "Our hearts are deeply grieved over the tragic event that occurred Sunday morning, April 24 at our Montgomeryville campus," the church posted a statement on its Facebook page. "As a church family, we are shocked and heartbroken over what took place, and our congregation is in prayer for everyone involved… We also want to extend our sincere thanks to the many police officers and first responders for their kind assistance in these very difficult circumstances." The shooter, who had a permit to carry a concealed weapon, which was believed to be a semi-automatic handgun, had not been charged as of early Monday, and police said he was cooperating with the investigators working "to determine whether this shooting was fired under the law." "There's no one in custody," Steele was quoted as saying. "The individual involved in the shooting is cooperating with police at this point." 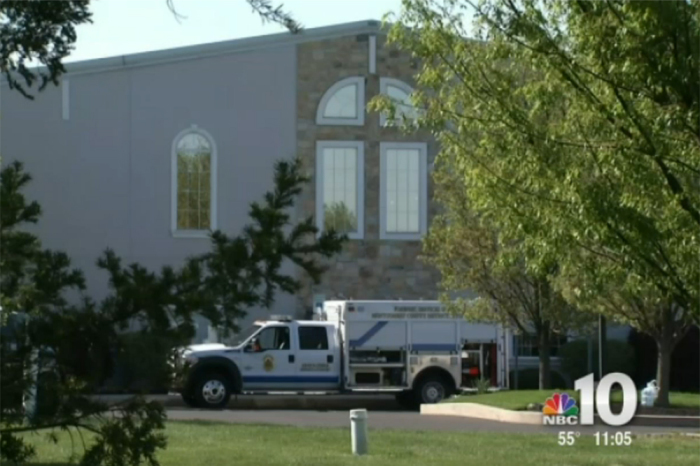 "It sounded like three pops, almost like a champagne bottle opening three times," Breeana Somers, a 24-year-old Temple law student who was inside the church at the time of the shooting, told NBC10.com. "Everybody's trying to make themselves as small as possible. You could hear some screaming and some crying but it was pretty silent. I went under a chair in a fetal position. I tried to make myself as small as possible. It's really frightening that anything like this could happen here." The church said, "In light of Sunday's tragedy, we are coming together as a church family at our Skippack campus for a time of prayer and comfort. Please join us Monday evening … as we approach God's throne of grace and seek His healing presence in our time of need."